"Daddy, let's order a pizza," Billy said. "That sounds like a good idea," said his dad. They looked at a menu they had at home. "What kind do you want?" his dad asked. Billy wanted a large pizza. He wanted a pizza with four toppings. He wanted cheese, pepperoni, ham, and pineapple. His dad said that sounded good. He called the pizza place. "They don't have any pineapple," dad told Billy. "What do you want instead?" Billy wanted sausage instead. His dad ordered sausage instead of pineapple. About 30 minutes later, there was a knock on the door. It was the pizza man. "Here's your pizza," he told Billy's dad. "That'll be $16." Dad paid the pizza man. He also gave him a tip. Dad took the pizza to the living room. A baseball game was on TV. Billy and his dad started to eat the pizza in the living room. "I hope the Yankees lose," Billy told his dad. "I hope the Yankees lose, too," his dad said. 2. His Dad ordered …. 3. The pizza cost …. 6. They wanted the Yankees …. ___ a. $16 and dad also gave the man a tip. ___ b. wanted to eat pizza. ___ c. to lose the game. ___ d. pizza with four toppings. ___ e. to the living room. ___ f. a baseball game on TV. 4. Did you get up early? (+) …………………………………………………………. 5. Your brother played guitar. (-)………………………………………………………. 1. A-What should I do before an earthquake? B-You should cover your head under a table. …………..
2. A- What should I do for a traffic accident? B-You should call for emergency services. ……………. 3. A- What should I do during a fire? B-You had better use a fire extinguisher. ………………. 4. A-What should I do when I burn my finger? 5. A-What should I do when I break my leg? 6. A-I have got a flu. What should I do? B-You should have a rest. ……………..
Ayhan: Did you watch ‘Kiralık Aşk’ last night? Sıla: ……………………………….. no. I watched a football match. Ayhan:………………………. You don’t like football. Sıla:Yes you are right. But my cousin came and he wanted to watch. Ayhan:…………………………………………………. . Who scored a goal? Sıla: I’m not sure but…………………………………………… Gökhan Töre scored a goal. Ayhan: who won the match? Ayhan: Wow,I like football so …………………………watch it on the net tonight. 1. My sister ………………….. play the guitar when she was five years old. 2. ……………… panic during an earthquake. 3. ………………………… , stay calm. Secondly, call for emergency. Then, wait until the ambulance arrives. 5. Travel Agent. Would you like to have window or an aisle seat? Passenger: I would like to have a …………… seat. Because I like seeing the clouds. 6.A.How ……………… does it take to London? B. It takes for about 3 hours. 7. ‘Machu pichu, Christ the redeemer, Petra’ are some of the …………………………of the world. 8.We ……………….. having a breakfast now. 10.Which one is NOT a symptom? 11. I …………… ill yesterday. 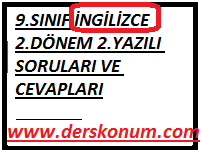 0 YORUM "9.SINIF İNGİLİZCE 2.DÖNEM 2.YAZILI SORULARI VE CEVAPLARI"